Fogo Island Arts is seeking submissions of short films (running time of 30 minutes or less) for the 2019 edition of Fogo Island Film: Resistance and Resilience. Winning submissions will be screened during two festival weekend events on Fogo Island and in St. John's, Newfoundland, in November 2019. Submitting filmmakers will also have the opportunity to qualify for a Residency Award with Fogo Island Arts and Story Development with the National Film Board of Canada (NFB) and other partners to encourage new creation. 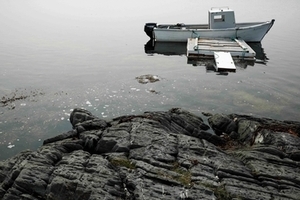 Fogo Island Film (FIF) is an international program on Fogo Island devoted to films that examine the diversity of relationships between nature and society. Organized by Fogo Island Arts, Fogo Island Film is devoted to actively supporting independent and experimental film production and to participating in contemporary artistic and scientific debate that addresses nature and culture as an indivisible whole. From May to November 2019, Fogo Island Film: Resistance and Resilience presents a selection of short and feature-length films completed within the last two years by emerging and established authors whose work explores the art of cinema and storytelling. Feature films are programmed by invitation. For the first time in 2019, FIF will be enriched by a competition in the Short Film category. Winning submissions will be screened at the Fogo Island Inn Cinema from November 15 to 17 and at The Rooms, St. John's, from November 22 to 24, 2019, as part of special events featuring highlights from the series and invited guests in conversation around the themes of the program. Successful applicants to the open call for short films will be selected by a jury which includes Annette Clarke, Executive Producer, NFB Quebec Atlantic Studio; Lasse Lau, director, editor, producer; Alexandra McIntosh, Director of Programs and Exhibitions, Fogo Island Arts; Matthieu Orléan, artistic collaborator, Cinémathèque Française, Paris; and Goran Petrović-Lotina, researcher, theorist and founder of FIF. Short film submissions are accepted exclusively via FilmFreeway. Multiple submissions are accepted. Applications must include a completed entry form and a preview. Fogo Island Arts is a residency-based contemporary art venue for artists, filmmakers, writers, musicians, curators, designers, and thinkers from around the world. Since 2008, FIA has brought some of the most exciting emerging and renowned artists of today to Fogo Island, Newfoundland, to take part in residencies and to present solo exhibitions at the Fogo Island Gallery. FIA also presents programs in cities across Canada and abroad, including the Fogo Island Dialogues interdisciplinary conversation series, as part of its international outreach. FIA is an initiative of Shorefast, a registered Canadian charity with the mission to build economic and cultural resilience on Fogo Island.